Those in my age range of (mumble) may remember an old puzzle game featuring a real metal ball and a real wooden board with holes in it. Younger folks may remember Nintendo's Super Monkey Ball. 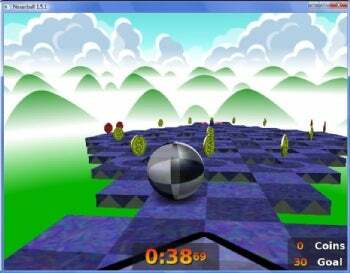 Neverball (free) is, basically, Super Monkey Ball without any monkeys. Use the mouse to tilt a playing field, causing a ball to roll down the incline. With careful control, you can scoop up coins, bounce over pits, even (at higher challenge levels) zoom around tubes in a gravity-defying spree. Or, if you're like me, you can send your ball careening over barricades and into the void so fast it probably leaps out of the game and ends up coming to rest somewhere around my 2004 tax archives. Thanks to active open source development, Neverball's production values and gameplay exceed what you might expect from a free game. In short, Neverball requires patience, finesse, timing, and dexterity, none of which I possess. Nonetheless, I can appreciate the quality of gameplay--and the sheer amount of it--that you get for free. An open source game released under the GPL, Neverball exists solely due to voluntary efforts by programmers and level builders, and, unlike far too many "free" products, this one has the quality you'd expect from a commercial game. I encountered no bugs or interface oddities, and gameplay was slick, smooth, and hyper-responsive. You get over a hundred levels, ranging from "Easy" (I could do them in under five tries) to "Challenging" (unless you are a 13-year-old with reflexes like a weasel on speed, you will tear your hair out). But that's not all! Included free in the installer is "Neverputt," a golf version of the same game concept--you must carefully putt your ball into the hole, again dealing with ever-more-complex levels as you progress. Neverputt is a game which does not require reflexes, just careful estimation of force and angles--a lot easier for old fogeys like me. Free. Fun. Challenging. Two professional-quality games in one package. Why are you still reading this when you could be playing Neverball?